After showing JZ (5) and J-Bug (4) how to make rain in a jar, JZ asked me how to make lightning. 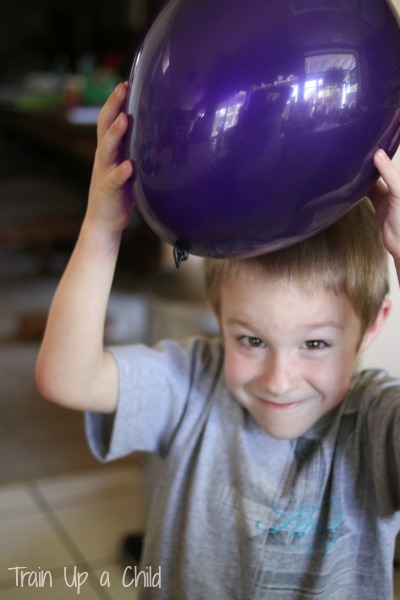 I decided to show him by demonstrating static electricity. A lightning bolt is basically a dramatic display of static electricity in action. You see lightning when a spark of moving electrons races up or down between a cloud and the ground. 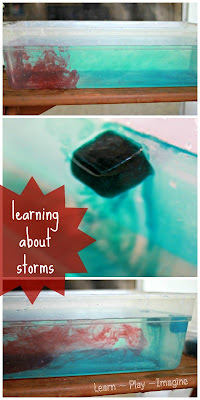 To demonstrate how to make lightning I set up two simple science experiments. 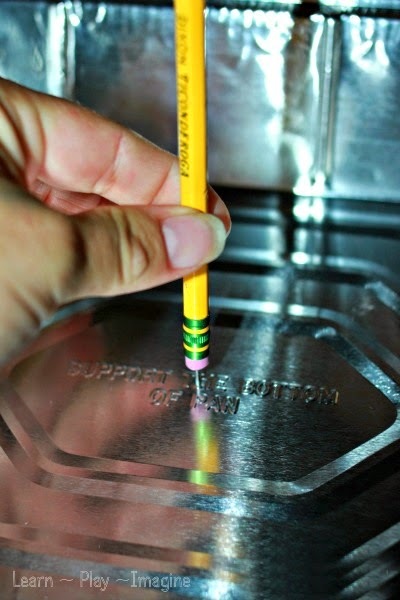 To show JZ how to make lightning I stuck a pushpin through the center of the aluminum tray then stuck the pencil eraser to the pushpin. 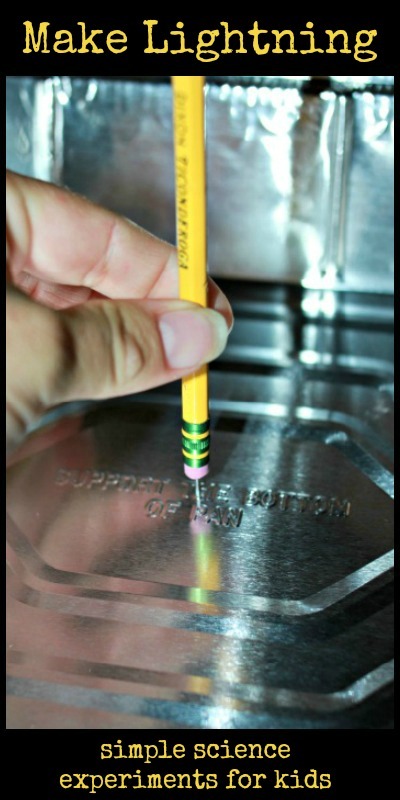 The pencil served as a handle to lift the aluminum tray. Next I had JZ vigorously rub the wool on the Styrofoam tray for two minutes. It really takes two solid minutes, and he had to rub hard and fast for the experiment to work. Note: If you don't have wool, rub the Styrofoam on your hair for two minutes. Finally, we picked up the aluminum tray using the pencil handle and set it on the Styrofoam plate. Unfortunately, no matter how hard I tried I could not capture the spark on film. It didn't even show up in the video I took. To see the spark you'll have to try this for yourself! Trust me, it's a lot of fun and worth the few minutes. The second experiment we used to demonstrate how to make lightning was much more simple and only requires two items. Have your child rub the inflated balloon vigorously on his head for two minutes, or take turns rubbing it on each other. The go into a dark room and touch the spoon to the balloon and see what happens! For more science activities for kids follow me on Pinterest. Now you get me curious and want to see the sparks from the aluminum tray. Will have to try. I love this experiment! Thanks for sharing! I would like to invite you to come link up this post on my Money Saving Monday Link Up. What a fun way to de-mystify lightening. Your boy's smile tells it all...he is loving this. Love this one, can't wait to try it out! Oh that is so cool. I'll have to pin this for later! Awesome! Thank you for sharing--I'm going to totally do this with my kids. Btw, is it wrong that I was totally distracted by your gorgeous Didy Indio in this post?!? If you open a bandaid in a dark room, the adhesive puts off tiny blue sparks as well. I may or may not have opened an entire box of bandaids in the middle of the night when I discovered this as a kid. Parents weren't pleased... but then we opened another half-box when they realized I was serious about what was happening. This effect is called triboluminescence--Google it ☺The band aid activity got me an "A" grade in a college physics class 25 years ago!! I have never had success with the WintOGreen Lifesavers, but other folks have. If you want to take a picture, try doing it in low light or dark and putting the camera on bald settings (if you have an slr). It's how nature photographers do it. It's not so much as catching the moment but imprinting the the light. 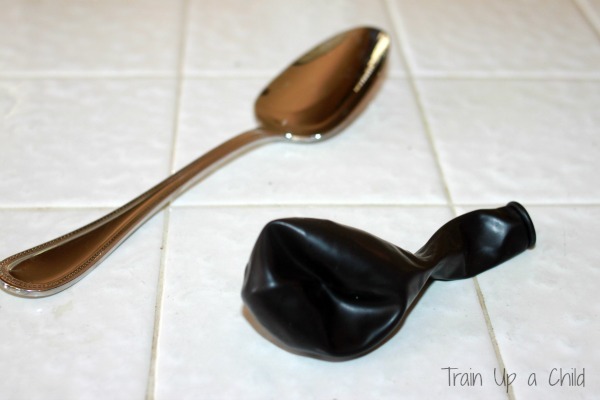 For the balloon rubbing method,do you have to go into a dark room to cause the spark or is it still visible in a room with the lights on? It's pretty hard to see in the light. It's much easier in the dark. I love teaching science and this experiment is very intriguing! Going to try it! Hi I tried this experiment with styrofoam piece(around 4 inch square) from a packaging and aluminium tray. But the spark is not coming. What a really cool idea for kids to play with and learn about electricity. Who knows, they might fall in love and find a great career path! Allison, the experiment on how to make a spark is what is called an electrophorus. To charge the tray when it is resting on the plate touch it momentarily with a finger. Then remove the tray from the plate by holding on to the handle. You should now be able to draw a spark from the tray. To recharge the tray just put it back on the plate and touch it with a finger again. 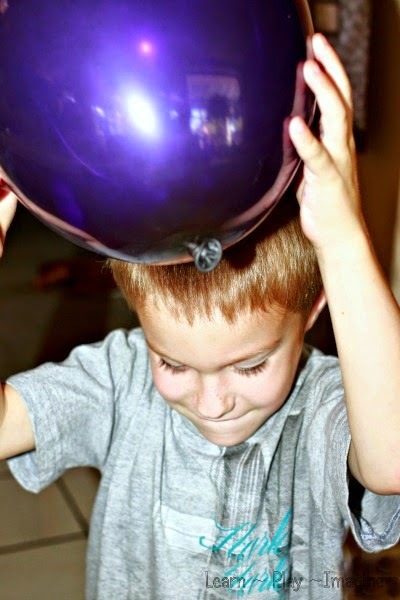 What a fun science activity for kids. Being interested in electricity can lead to great career opportunities. I love seeing kids getting that Spark! !